Our stay was one for the books. The cabin was very clean and cozy. It felt like home as soon as we arrived. The owners were kind and accommodating from the beginning of the booking process to the end of our stay. They made it personal by baking cookies and having a special cake for our guests celebrating their anniversary. The cabin was well stocked with everything we needed. It was nice to have a full sized washer and dryer. We had plenty of towels, and paper products. The kitchen was great for preparing our own dinners, with all of the appliances and serve ware that we needed. The table was large enough to seat everyone and made for great dinners, card games, and just visiting throughout the day. Everyone commented on how good the complementary coffee was! The views from the deck were amazing in the day, and at night it was so neat seeing the distant lights from the valley below. It was so peaceful. I recommend this cabin 100%. If I could give them more than 5 stars, I would. Thank you Tom and Sue for a great stay! It was a perfect girls spring break gate away? last minute booking, we didn’t expect all of that!!! Cabin was extremely clean( they allow dogs, you couldn’t even tell that they were any in the past) we travel with dog as well, and there wasn’t a time our pup sniffed past presence of other dogs,great job cleaning. Bedrooms and bathrooms are so cozy and comfortable, we love eating our meals at the cabin, kitchen was fully equipped so you can even bake? morning coffee in the rocking chairs or on the swing on one of decks was perfect start of the day, finishing day with glass of wine watching stars just incredible. Hot tub was super relaxing and calming, two teenage girls had so much fun walking around and exploring the surroundings. There is short walk ( maybe 10mintes ) to the park close to the gate, our dog love to take morning walks there and the creek nearby was just delightful music for our ears!!! The best part is the drive, hahaha first time we drove at night, and we could just say how high we are going by lights popping out on the across hill, the view is the best!!! Honestly the best cabin we stayed in at north Caroline mountains!!!!! 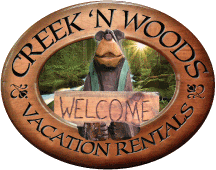 Creek n' Woods is a small, family owned and operated cabin rental company. We specialize in personal, detailed service to make your vacation experience the best it can be. Our rentals are literally on creek and woods. We are fanatical about the quality of our cabins and strive to make theses unique settings your home away from home. We hand picked the locations to provide great access to what vacationers love about the Maggie Valley area, while assuring your privacy. 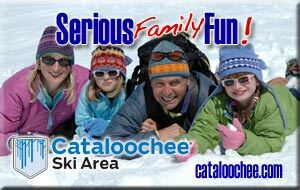 We can assist you in finding the locations of all the major attractions in Western North Carolina and make sure that your time is well spent. To the west you'll find The Great Smoky Mountains Railroad and The Cherokee Indian Reservation with Harrah's Cherokee Casino. Head west and you'll run into one of the most visited national parks in the country, The Great Smoky Mountains National Park. Just beyond that lies Gatlinburg, Tennessee with Dollywood. East, the cultural center of Asheville with museums, shops and the Biltmore Estate, America's largest home. In all you can say the our location is a great place to base your Smoky Mountain Vacation, We're in the center of it all.